Pocket Constitution Books. Bulk Discounts & Custom Editions. National Best Seller. Non Partisan. In "The U.S. Constitution & Fascinating Facts About It" you'll see the entire text of the Constitution, the Bill of Rights and the Declaration of Independence—and much more! You’ll find interesting insights into the men who wrote the Constitution, how it was created, and how the Supreme Court has interpreted the Constitution in the two centuries since its creation. Need 2,000 Copies Or More? Customize your Pocket Constitutitons with a custom cover, foreword, and more! Veterans Groups, Political Parties, U.S. Courts, Law Firms, Bar Associations and more! This little book introduces you to the greatest legal document ever written: the United States Constitution. 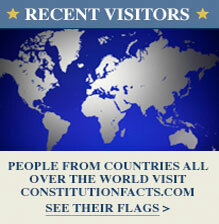 The Constitution is certainly the most influential legal document in existence. Since its creation some two hundred years ago, over one hundred countries around the world have used it as a model for their own. And it is a living document. It is one of the world's oldest surviving constitutions. And, while the Supreme Court continually interprets the Constitution so as to reflect a rapidly changing world, its basic tenets have remained virtually unchanged since its inception, and unchallenged as well. People quarrel over its interpretation, but never do they question the wisdom of its underlying principles. Imagine creating a document that governs your grandchildren's grandchildren's grandchildren! That's what the men of the 1787 Constitutional Convention did. For this very reason, great people have spent their lives studying and interpreting the Constitution. In this little book, you'll begin to see why. You'll get a taste of some of the Founding Fathers' thoughts. You'll see some of the reasoning behind the Supreme Court's land- mark decisions. But, most importantly, you'll get a feel for the Constitution itself and how it is that a document that was written over 200 years ago still plays an integral role in our everyday lives. Terry L. Jordan recently retired from a thirty-five year career as a public school teacher, of .which thirty-two of those years he spent at Orange High School in Pepper Pike, Ohio. He taught Advanced Placement United States History for twenty-two years, and has spent much of his life studying, interpreting and teaching students about the U.S. Constitution. He received a B.S. in Education from Taylor University in 1970 and an M.A. in History from Cleveland State University in 1981. “"This U.S. pocket constitution book is a perfect jewel for all citizens from grade school on up. I stumbled across it after I lost the first pocket constitution I was given in high school. Although less than 100 pages from cover to cover, this book contains so much valuable information on the founding of the country, including facts on many of those who guided the Constitutional Convention in Philadelphia. The book also contains the Declaration of Independence, the Articles of Confederation and key dates and Supreme Court cases that have shaped this country and the Constitution's interpretation. This pocket constitution is a keeper for all who cherish our freedom and should be read and re-read as a reminder of why this is a great country and why it prospered in relatively short order." "WOW! That's the only word that can possibly come out of one's mouth when you get a load of this book. This book is something that should be used as a reference in every home! There is a copy of the entire Constitution, Declaration of Independence, Articles of Confederation, heck, what more could you ask for? Facts? You ask for facts? Hey, there are awesome facts, good to know facts, and just for the fun of it facts, too! Like, in 1878, an amendment stating that an executive council of three should replace the president tried to get passed! For only a few bucks, I'm very glad I purchased this U.S. pocket constitution book because I love it and use it all the time."